Young Woman Reading as Older Woman Writes. 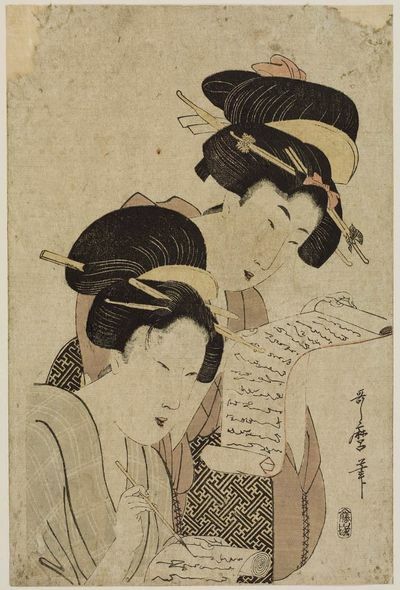 Artist : Kitagawa Utamaro c. 1806. In response to figures that showed that female writers and reviewers tended to be marginalised, and an atmosphere in which Toronto literary professor David Gilmore actually publicly stated that he taught his students only about books by "serious heterosexual guys", writer Joanne Walsh declared 2014 the year of reading women. She decided to read only books written by female authors for the following year. Lilit Marcus tried the same thing in 2013 and found it odd that people asked her why she would limit herself that way when the question was never asked in reverse. She found that her reading list changed the way she viewed the world around her and that she did not feel that she was missing out on anything. Looking over my own reading list for 2014 (yes, I keep a list, I'm nerdy like that) I noticed that (excluding comics) I have read 60 books, of which 30 were by men and 30 by women. That's not something I did on purpose, it just happened that way and I suspect it's not typical. I would love to try reading only women for a year just to see what that's like, though I will have to make an exception for books by men that I have already made a commitment to read and review. I'm also starting a bit late, though I suppose I could go from February to February. At the very least I should be able to tip the scales to about 70/30 in favour of women writers. There are so many female writers in both literary and genre fiction that I've been meaning to get around to. On my shelf right now waiting for me to get to them are books by Joanna Russ, Stacia Kane, Kelley Armstrong, Maya Angelou and Denise Scott. Do you read mostly male authors, or mostly female, or an equal mixture of both? And is a year of reading women something you'd be interested in trying? Are there any particular female authors you've been meaning to read but never gotten around to before? I mostly read books by women, with the exception of GoT and a book about a convict woman that were written by blokes. YAY for a year of reading women! I'm going out on a limb here - going through my reading list I find I'm about 60/40 male female ratio. My viewpoint and selection of reading material isn't biased or based on whether it's written by a male or female BUT rather on the merit of the work and the area of interest I have. It seems as though we lean towards discriminating against gender as opposed to how well something is written. Instead we should be reaching out encouraging people to read and to buy books and develop an appreciation of literature without the need to disseminate books written by gender. The greatest gift my father (as my mum was never interested in reading books) was to give me a love and appreciation of reading a balanced selection of literature. Subsequently one of my favourite books (which I'm reading for a second time) is the story of Gina Rinehart, written by Adele Fergusson. I won't, unfortunately try a year of just reading women - I want my reading to be balanced. Absolutely I would. Most of my favourite authors are female writers. As a birth doula a huge amount of my reading is birth related...And that is mostly by women. I've been reading mostly female writers recently, but that is just because those books are the one's that interest me. I read a pretty good mix usually. Sadly last year I probably only read half a dozen or less books :-( Mostly women, with a couple of the Odd Thomas books thrown in. I probably wouldn't consciously limit my reading to female only, simply because I don't want to limit my options - but I think that for someone who mostly reads male writing it can be useful to read more female writers simply for a different perspective and visa versa. I'd love to try it. At the moment I'm finding it hard just to have the time to read any books though that this year really isn't the year for it. I tend to read a lot of stuff by women authors by default too. Interesting reply Jen, it's an instance, possibly, we'll have to agree to disagree! That sometimes happens. In my comments on a question, I will ONLY present FACTS, as I've learnt or EXPERIENCED. I do NOT embellish to 'make it look good', therefore by my reckoning, I don't lie. That's not to say people do 'lie' on a website such as this. I'll just bide my time, & see how things progress, but it's blatantly obvious I'll have to be 'less enthusiastic' with comments/replies' to subject matter in which I've a great deal of interest. Cheers for now! Do you know when you ovulate? Do you grown any native plants in your garden?